This is the first time I have presented a repost here on Oliver di Place. I don’t plan to make a habit of it. But I didn’t have time for a new post this time, what with finishing the move, and I wanted everyone to have something to enjoy from me going into the weekend. I chose this post from just over a year ago because I put up the original right before I had to change file hosts, so not many people got to enjoy the songs before they came down. Also, I have many new readers and listeners since then, so hopefully this is brand new to many of you. Regardless, enjoy and have a great weekend. And be assured that regular posting of new material will resume next week, starting with my next album review. 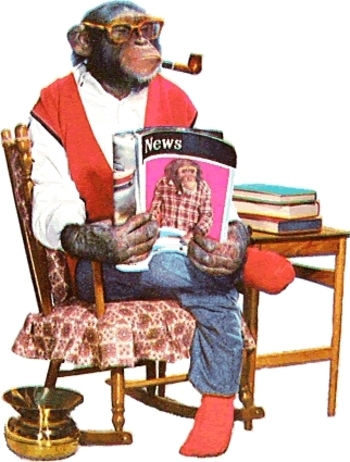 Charles Darwin was famous for letting us all know that we used to be monkeys. Fortunately, we have made great strides since we came down from the trees. What about "The Monkey Speaks His Mind" by Dave Bartholomew? Bunny, I'm somewhat embarassed to admit that this one is new to me. You're right, it would have fit perfectly. Do you, by any chance, have the mp3? I'm sorry but I only have it on old-fashioned pure vinyl. Dave Bartholomew is the man--still alive and kicking--who produced all of Fats Domino's hit records. "The Monkey Speaks His Mind" is an extraordinary song because Dave truly "tells it like it is" (to paraphrase Aaron Neville). Dr. John also recorded a version but Dave's original is far superior.